Parfum d’Empire is a perfume house very dear to my heart. First, because when I started my quest of leathery scents before a perfume workshop, i twas the first house I tried. 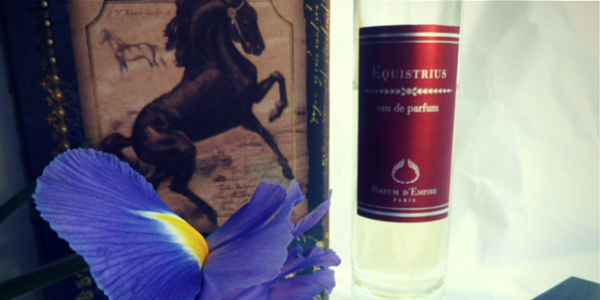 And Equistrius, with Cuir Ottoman, is my first perfume of this brand. Since I know the brand, I’ve always fancied the generosity you can feel into the fragrances. The abundance of beautiful raw materials, widely used, with no restrictions, with a nice price for a niche perfume house! I met Marc Antoine Corticchiato , creator and nose of the brand, and I can tell you the generosity you can feel into the fragrances is the reflection of his own and of his passion for beautiful raw materials. I must admit, considering its name, I expected Equisitrius to be more of a horsey leather ! But when I learnt its story, I loved it even more. Marc Antoine Corticchiato has been an accomplished rider since his childhood. He had almost become a professional rider in jumping. But he changed his mind because of… plants! And became a chemist. Equistrius was the name of his best jumping horse. As a former rider (15 years long !) and a former veterinary, I have a particular soft spot for this perfume and its story. I hope I’ll be able to talk about it as I want, because it’s sometimes hard for me to really express what I want to say about perfumes I really love. On my skin, the first note of Equistrius is a green one, almost aromatic. Almost immediately the violet takes place, with a rice wine touch (thanks to the ambrette), fruity and powdery. Now comes the orris, used in the fragrance with 3 different type of extraction / raw materials, first with its leathery touch. Here this leathery note reminds me of a beautiful suede, so smooth when you touch it. Equistrius snuggles on the skin, with an aura of chocolate orris, without at any moment falling into the sugary / gourmand side. More of a skin perfume, it’s not so innocent! The duet between the orris and the sandalwood brings a smooth note, almost creamy, like a lipstick used to write a love note onto a mirror. 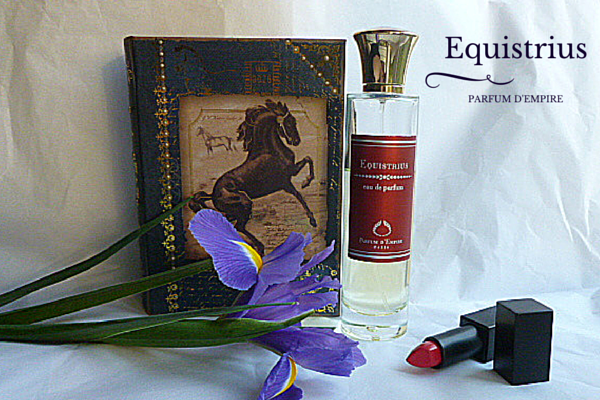 When I first sniffed Equistrius, I knew it was my “cosmetic leather”, this perfume which talks about a lipstick fallen at the bottom of a leather handbag of great quality. The orris/violet chord may be a classical one, the chocolate note (brought into the fragrance by an orris absolute extracted in a specific way to have this note. I had the chance to smell it, it’s a dream!) and the light brought by the ambrette makes Equistrius incredibly feminine and sensuous. The affinity with the skin is amplified by the generous use of ambrette (which is a vegetal-based musk), the smoothness of sandalwood and a touch of animality from the ambergris. Tell me, do you know Equistrius? Or other Parfum d’Empire perfumes?